WHY ASTROLOGY? 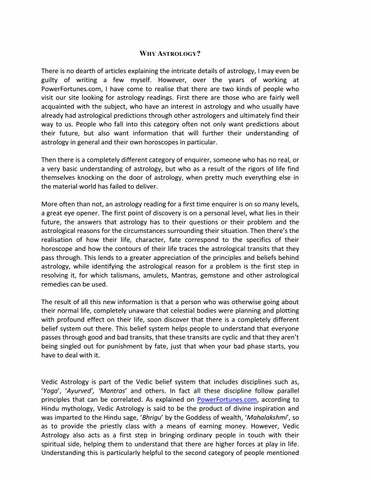 There is no dearth of articles explaining the intricate details of astrology, I may even be guilty of writing a few myself. However, over the years of working at PowerFortunes.com, I have come to realise that there are two kinds of people who visit our site looking for astrology readings. First there are those who are fairly well acquainted with the subject, who have an interest in astrology and who usually have already had astrological predictions through other astrologers and ultimately find their way to us. People who fall into this category often not only want predictions about their future, but also want information that will further their understanding of astrology in general and their own horoscopes in particular. Then there is a completely different category of enquirer, someone who has no real, or a very basic understanding of astrology, but who as a result of the rigors of life find themselves knocking on the door of astrology, when pretty much everything else in the material world has failed to deliver. More often than not, an astrology reading for a first time enquirer is on so many levels, a great eye opener. The first point of discovery is on a personal level, what lies in their future, the answers that astrology has to their questions or their problem and the astrological reasons for the circumstances surrounding their situation. Then there’s the realisation of how their life, character, fate correspond to the specifics of their horoscope and how the contours of their life traces the astrological transits that they pass through. This lends to a greater appreciation of the principles and beliefs behind astrology, while identifying the astrological reason for a problem is the first step in resolving it, for which talismans, amulets, Mantras, gemstone and other astrological remedies can be used. The result of all this new information is that a person who was otherwise going about their normal life, completely unaware that celestial bodies were planning and plotting with profound effect on their life, soon discover that there is a completely different belief system out there. This belief system helps people to understand that everyone passes through good and bad transits, that these transits are cyclic and that they aren’t being singled out for punishment by fate, just that when your bad phase starts, you have to deal with it. earlier, as this helps them to understand that there is order to chaos and that things happen for a reason. Hence one of the purposes of Astrology (Vedic) would be to serve as a stepping stone, introducing those who were otherwise oblivious of spirituality to the basic concepts and from there on to how ever far they wish to go. 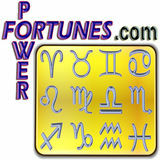 PowerFortunes.com explains what happens when people seek astrology readings.